A trail camera is very different from a security or surveillance camera. Knowing the difference means getting the camera you need. I assumed that a trail camera was something that most people understood. Then again, I’m from the wilderness wonderland of Michigan, the deer hunting capital of the U.S. If I were someone who lived in the desert of California, I might not understand a trail camera, also called game cameras or stealth cams. I might even look at these devices and think they’re no different than a home security camera. Although both devices are cameras, there are huge differences between a trail camera and a security camera. Each gadget is designed for its specific and intended use. If you’re a regular on this blog and Solid Signal’s mailing list, you’ve probably seen the GSM Scout Outdoor Stealth Cam we carry. While this gadget might look like a nondescript grey box at first, it’s really an amazing little device. You see, stealth cams are typically used by hunters to get an idea of what types of animals are on their property, and what are their feeding habits. All this can be determined by setting up a trail cam in your backyard or hunting property. Place a pile of bait in front of the tree where your stand or deer blind is located. 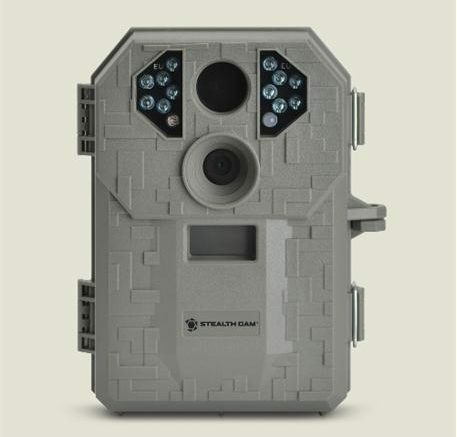 The stealth cam is powered by eight AA batteries, which are usually good for up to seven days of use and a total of 40 night vision and/or daytime pics. (Individual results can vary.) A low-battery indicator alerts you when it’s time to change batteries. Return the next day to download the images your captured using the camera’s 32 GB SD card slot or mini USB output for downloads in the field. All of the magic of the stealth cam happens when you’re not there. Simply put, animals are drawn in by the food you placed as bait. As they come in to eat, they’re bodies will pass in front of the camera’s sensor. Each time this happens, the GSM Scout either takes a burst photos or a short video caTrail Camera Vs. Security Camerasptures, depending upon your setting. Since the camera has When you review your footage, you’ll get a good idea of what types of wildlife you have and what times these critters come to feed. Security cameras have a very specific purpose and it has nothing to do with wildlife. These cameras are used to capture and document intrusions, trespassing, and other inappropriate acts done by our fellow human beings. The term “surveillance camera” is used to describe cameras used for the overall act of watching and recording activity on a specific premises. Security/surveillance devices are a sad reality in this day and age where criminals are intent upon stealing our belongings and doing harm to our families. Could you use a security camera or surveillance camera to capture footage of wildlife? I suppose so. Some security cameras have motion detectors and night vision, and they transmit their signals to a PC or other recording devices. And some of these devices are wireless. But even with all that, security cameras are rather impractical as stealth cams. To see the pics you want – the animals on your bait pile – you’ll have to sit in front of a monitor for an entire day or sift through hours of footage. Trail cams take pictures only when the animals come to your bait-pile, and the device’s time/date lets you know when the critters are most active. If you’re a hunter or outdoor enthusiast who wants a trail camera, Solid Signal has the GSM Scout. It’s one of many electronic gadgets for hunters that we carry. We’re also your source for security or surveillance cameras. Our equipment packages come with two, four, and even eight security cameras from top manufacturers such as Amcrest, UNIDEN, and SecurityMan. If you want the peace of mind that a security/surveillance camera provides, call us at 877.312.4547. We’re happy to answer questions and make product recommendations to match you with the best security camera.